If you’re not reading the parsha carefully, you might miss the Torah’s source for a man betrothing a woman with money. The pasuk says “When a man takes a women…” (22:13). How, you might ask, does that prove that a ring can do the trick? The Gemara (Kiddushin 2) connects it to another verse, using the same word “yikach”, “take”: “I will give the money for the field, take it from me” (Bereishit 23:13). This is what Avraham said to Efron in order to buy the field of “Machpelah”, the ultimate burial plots for him and his wife, Sarah. The parallel, however, is a bit odd- why are we deriving the union of a husband and wife from the acquisition of a field? If we take a closer look, we notice something fascinating about the two sources. The first source -in our parsha- is pretty straightforward: “man takes a wife”. The second source, on the other hand, says the word “take”, but it’s barely referring to taking at all. In fact, the statement is Avraham’s insistence that Efron take -not the land- but the money he is giving him. With this, we realize that the source of betrothing a wife is not paralleling the acquisition of land at all, but rather the desire of Avraham to give. He insisted that Efron take his money, that is the “taking” we can learn from. Implicit in this source is a message for the relationship of husband and wife: when you give, make sure it’s because you want your spouse to have something, not because it serves your own interest. Commentaries discuss the character of our prayers on Rosh Hashana and Yom Kippur. Many times – they say- a person supplicates Gd like a dog: “hav… hav…”, “give me life, give me food”, constantly asking Hashem to give us stuff. In actuality, our prayers should be requesting -not so that we can take- but so that we can give back with what we take. Many times we will say the “Avinu Malkeinu” and ask for a litany of luxuries from Hashem. Ultimately, however, we’ll say at the end, “Avinu Malkeinu, aseh l’ma’ancha”, ‘do so for Your sake’; Do it so that with everything You give me, I can give back- to You, to Your community and to Your Torah. 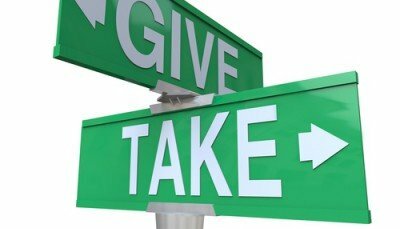 This is another example where “take” really means “give”. What we learn from Avraham is how we approach our relationship with Gd on the High Holidays: With a petition -not for taking- but for giving.